With the NFL season more than halfway through, it's highly likely that many players have sustained injuries not only to their knees, shoulders and ankles but also to their hands. 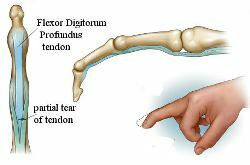 Jersey Finger is an injury that primarily occurs in football and other contact sports. As we roll into the end of the season and playoffs this may be a good time to review what jersey finger is and how it's treated.